As I was weeding the garden I discovered something very important about myself…I really love NOT weeding the garden. Of course I continued the dreaded task at hand, while pondering the entire time on all the other things that I love NOT doing. Hmm, I guess I’m not surprised at the list, maybe just the length. I loved NOT having to use too many brain cells writing this, which gave me some much needed free time to … Enjoy the Ride! Your ‘I love not camping’ picture is great! Hahaha…it was love at first site for me. Ann Taintor has a great line of hilarious photos. Camping is a lot more fun if you bring a life time supply of beer, and drink it in a weekend. Just saying, that’s one of the perks of the wilderness. Davy Crockett would’ve wanted it that way. Hahahahaha! From what I hear Mrs. Crockett told Davie to save his raccoon hat for the boy’s weekend, she preferred fluffy towels. Would you like to have a long discussion about farts/farting? Cause I would love that! Farts are funny. I don’t care who you are, it makes people laugh. Several years back, I was visiting my wife in San Francisco. It was perhaps one of the coldest winters on record there; even in the sun, it felt like a paltry 30 degrees outside. My wife and I were driving through the city with her car’s heater going full blast. Little did I realize, but the chili dogs from Wienerschnitzel that I’d eaten the night before were going to make an assault on our senses. Yes, the farter starter caused a stench to escape my nether regions, a flatulence so foul and smelling of brimstone that one might have suspected it was a sign that Satan himself was making an appearance within the confines of the compact car. To make matters worse, the heater was going full blast to combat the horrid winter chill outside. I couldn’t help myself – I immediately started giggling to myself, knowing full well that my wife was going to gag over the emanation that was seeping into the foam of the seat, the upholstery of the car, and finally, my wife’s nostrils. I love NOT having to watch badly crafted made for TV shlocky children shows. So glad my kids have passed the Barney stage! Love your list and agree pretty much with all of it, but plead insanity on number 10 because I love watching some sports especially with a fart humour appreciating fellow audience. I love how the kids deny ever having such love for the purple fur ball….Oh, do not make me pull out the videos of your hissy fits! I do enjoy watching Michael, mostly because he is a human fish. 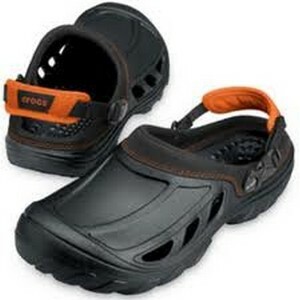 I love NOT seeing people wear crocs! Ewwww!! Especially love the dog picture. Animals are like that. They fart and leave. (Oh yes, husbands do that too!) This was a really great post! Omg! I can not thank you enough for the much needed fit of laughter with tears you just gave me! This is hilarious & the story with the fart from hell will have me giggling like a teenage boy for the rest of the day! thanks for the list, very cute! Great list, Tops. 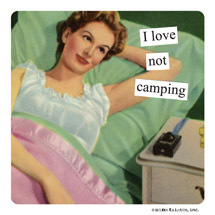 Not camping, not watching sports (especially baseball — why the hell does ANY sport need to be on EVERY F’ing Day???). But I will never admit to farting. Especially to my doctor who prescribes fart-inducing medicines and then asks if I do. I need to keep some pride, you know, Doc. Great list. My partner likes Fox News so sometimes I have no choice but to listen. Ugh…goosebumps are forming at that thought. 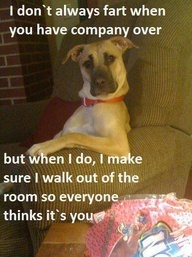 Very funny – love the dog – hate crocs too but shave legs constantly. Your pictures are always stellar. Do you have some type of artsy background? Your choices are always so perfect. I’m not a gardener either nor a camper be. If I can’t wear nice shoes and keep them shiny I have no interest. And dirt under my finger nails? Ugh!!! Cleaning the bathroom is another nightmare. I have Consuela who I owe a small fortune to. Luckily she accepts IOUs with long term payment plans. Thank you…no, no artsy background I think it’s just in the blood. My daughter thinks I’m Consuela! You are too funny. Really. You have no idea how much you make me laugh. Haha, good post, and I agree with you on all counts, although I think some classic country (Loretta Lynn, Willie Nelson, Johnny Cash, Merle Haggard) was good, although everything in the past 3 decades has been atrocious. The early country artists were rebels and trailblazers, and Loretta was quite the feminist. I could have some Johnny Cash…..
LMFAO – there is nothing quite like a well executed fart or talking about one. I’m also good for segues into all manner of things people consider disgusting, but they don’t bother me in the least. 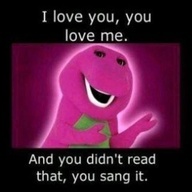 You’re right – even though my kids were all grown up when Barney came along, I still got that stupid song stuck in my head & I did sing it instead of reading it. 🙂 BTW I LOVE not exercising on purpose.